Is your Kuhn Rikon Pressure Cooker hissing and leaking? Is your pressure cooker not building any pressure any more? You probably need a new Kuhn Rikon pressure cooker gasket. 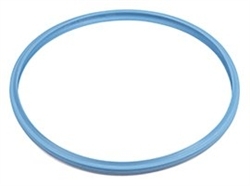 This original 22 cm sealing ring (1501) fits many cooker models. This gasket will get your cooker back into service. Be sure to make certain that you have reviewed your cooker's model number before selecting replacement parts to ensure a proper seal and fit. 03000 3003 3006 3008 30321 3040 3041 3043 3044 3046 3047 3049 3064 3068 3069 3140 3141 3142 3143 3144 3326 3327 3342 3343 3344 3351 3880 3881 3882 3914 3916 3918.